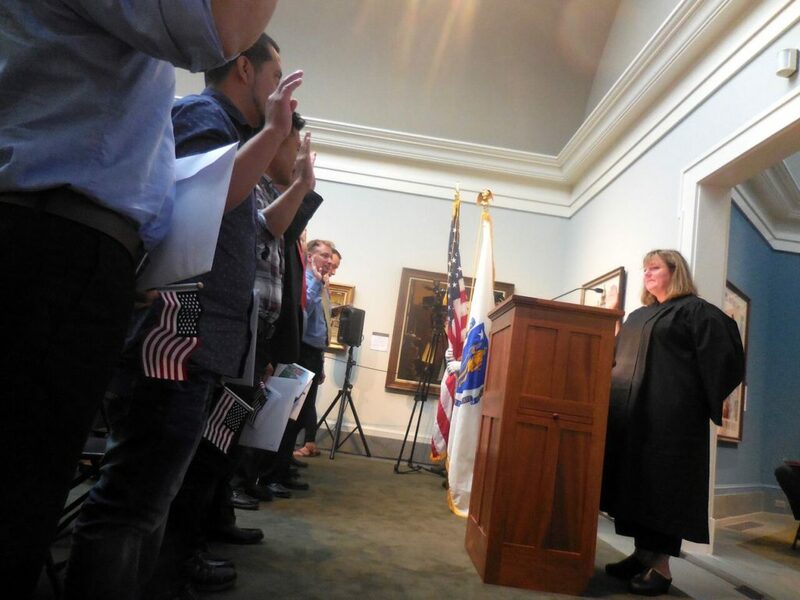 Joan M. McMenemy, first justice of Berkshire County Juvenile Court, administers the oath of citizenship to 23 immigrants Aug. 10 at the Norman Rockwell Museum. Stockbridge — The newly minted citizens were beaming. 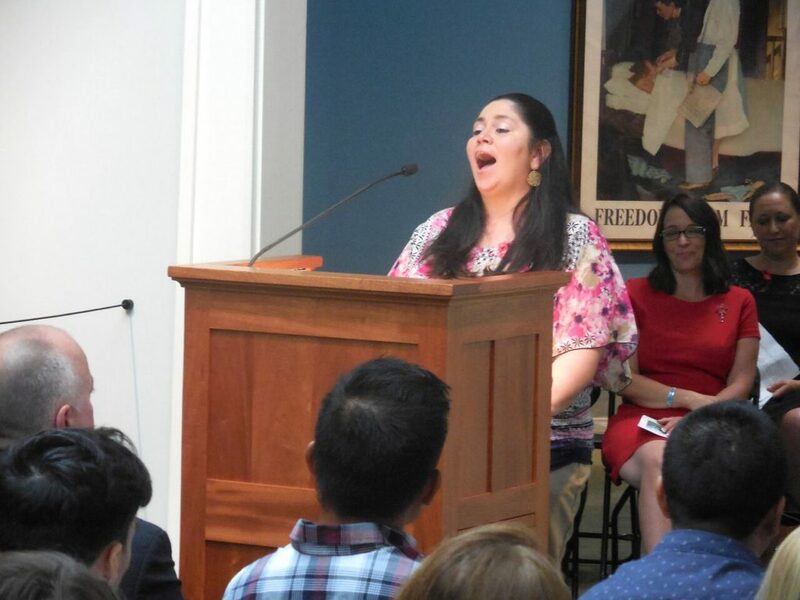 Their families and supporters were either smiling or, in some cases, crying as 23 western Massachusetts immigrants from 16 countries and five continents took the oath of allegiance and became citizens this morning. And you could hardly have chosen a more suitable location for the ceremony. The Norman Rockwell Museum celebrates the work of perhaps this nation’s most iconic painter, one whose images of small-town America have become touchstones of a simpler time. 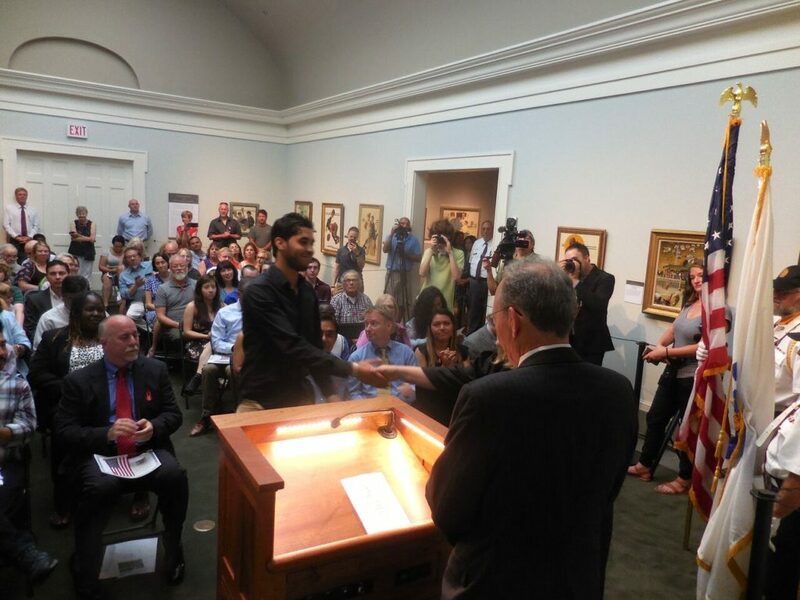 Before the immigrants raised their hands and swore to “defend the Constitution against … all enemies foreign and domestic,” the museum’s center room had to be turned into a courtroom, as per state law. 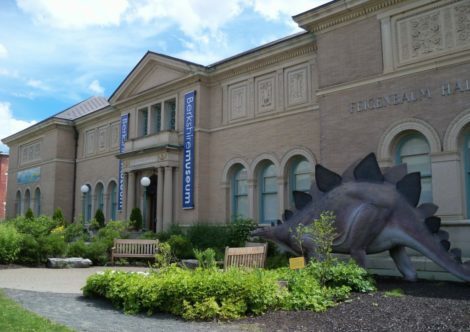 For the seventh year, the museum has partnered with the Berkshire Immigrant Center for the event. The ceremony, held under the auspices of the U.S. Citizenship and Immigration Services, is for residents of western Massachusetts who have immigrated to the United States from around the world. The special event gave members of the community the opportunity to greet fellow residents as they were sworn in as new naturalized citizens. “I know I speak for all of us when I say we look forward to this all day long,” said Brooke Mead, who heads the immigrant center. 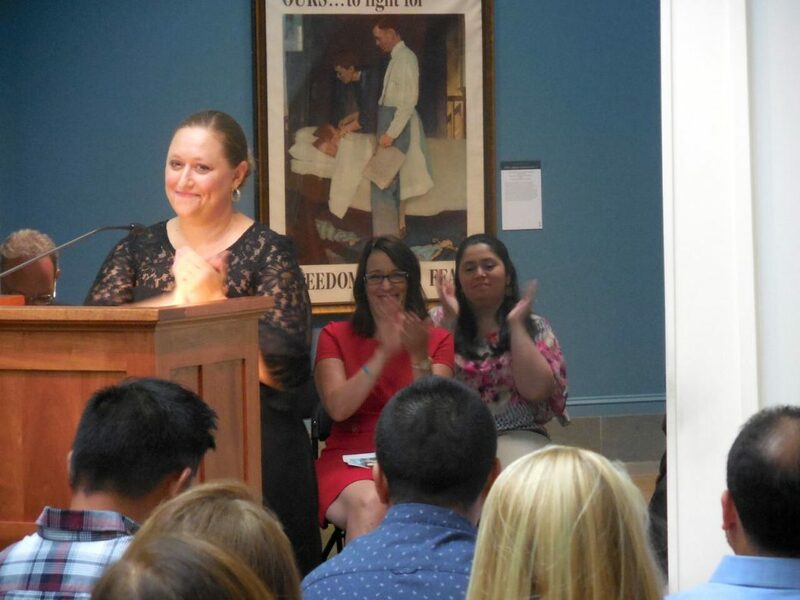 She added that the museum is “the most inspiring of backgrounds for a naturalization ceremony.” Click here to read an Edge story from last year when Mead was first appointed to lead BIC. “Congratulations and welcome, my fellow Americans,” Mead said to great applause. 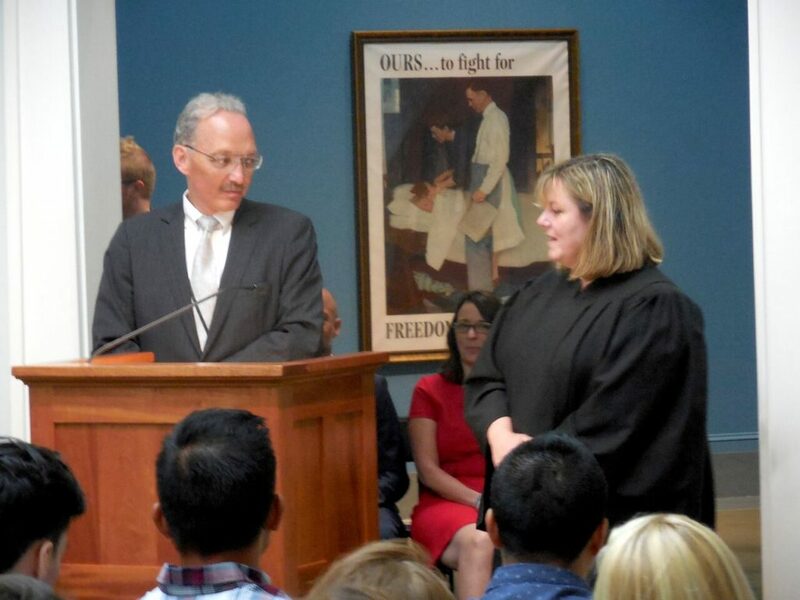 Joan M. McMenemy, first justice of Berkshire County Juvenile Court, was on hand for the third year in a row to preside over the ceremony and swear in the new, naturalized citizens. She offered words of wisdom for them. “A good citizen would never be afraid to welcome people from all corners of this planet and never forget the vital role that people who have immigrated to this country … have played throughout history in building this nation, in service to this country and enhancing the life experience of all,” McMenemy said, with a VFW color guard at her side. “We have some welcoming remarks from the president of the United States,” Forte said, eliciting barely audible gasps from some members of the audience. In a videotaped statement of about two minutes, President Donald Trump welcomed the new citizens. When he finished, Trump, who has limited support from the immigrant community, got only scattered polite applause from the 250 or so attendees in the three center rooms of the museum. Before the swearing in, Forte advised the candidates to proofread their certificates carefully. A typo or mispelling could delay their final swearing in by days or weeks. After the 45-minute event concluded, the Edge tracked down a couple of new citizens. Taha Bouras hails from Morocco and has been in the U.S. for five years. Most of his family members still live in Morocco. He works at Kripalu, the yoga and wellness resort in Stockbridge. Bouras was accompanied by several of his fellow co-workers. 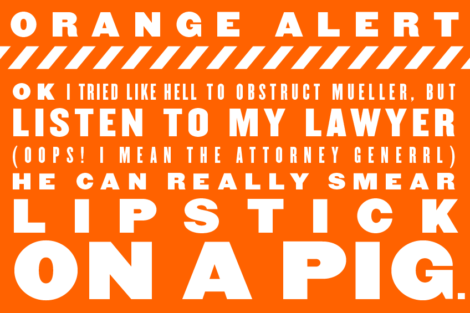 “It’s a big day,” he said in a brief interview. The journey to citizenship had been longer for Magdalena Mieczkowska, who is originally from Poland. She’s been here for 16 years, having originally come to America to attend the City University of New York. Mieczkowska runs Magdalena Events, an event planning and design company, out of her Egremont home. 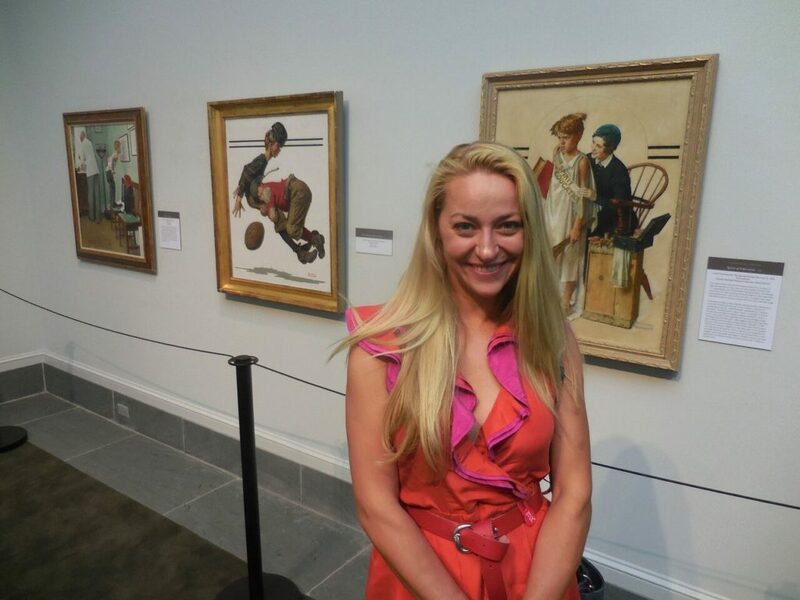 She has also worked in London but loves the Berkshires. Mieczkowska said she was told she would get her citizenship about a month ago. Asked if she jumped for joy, Mieczkowska said, “I did. 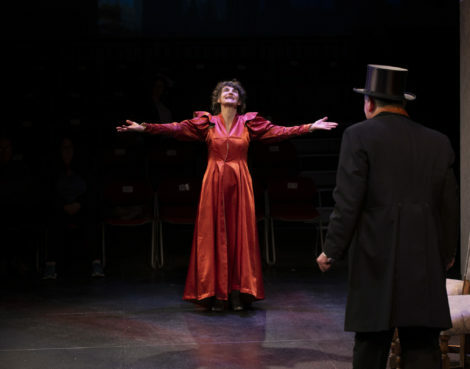 And I cried.” Mieczkowska has a sister who lives in New York City. The rest of her family lives in various locations in Europe. If Justice McMenemy had done a bit of research, she might not have chosen Elie Wiesel to single out as an example of humanistic thinking about “illegals.” Mr. Wiesel spent most of his adulthood trading on the fact that he was a Holocaust survivor but that experience unfortunately colored his views about the “other,” which in his case meant non-Jewish Israelis. He was one of the most ardent supporters of the subjugation of the Palestinians living in the West Bank and Gaza. About 25 years ago, in a speech to an overwhelmingly friendly audience in a Reform synagogue in New York, I heard him tell the group that Palestinian mothers put their young sons to bed each night with the prayer that they would grow up to be ‘shahid’…which loosely translates from the Arabic as martyr. Notwithstanding that the Likkud and other rightwing leaders reject the largely accepted demographic that the Palestinian population will outnumber the Jewish population of Israel and the occupied territories in about 5 years, comparisons with apartheid South Africa should not be dismissed out-of-hand. Every time I find the meaning of life, they change it.